Killer Characters: Searching or Running? New news: Yon Bonnie Books is open for business. Well, it has been since shortly after WWI, but Christine, Tallie, Summer, and I are the new owners, so the business is new to us. Newer news: Cakes and Tales, our adjoining tearoom should be open in two more weeks. And in a few more months Bedtime Stories, our B&B upstairs, will open. In the news: Una Graham came to interview Summer and me for the Inversgail Guardian. The interview went something like this, and it might give you an idea why Una is known as Ug. Ug: First, my readers will want to know why, of all the book joints in all the towns in all the world, did you walk into this one and buy it? My Bogie is far from brilliant, but I’m sure you catch my drift. Ug: Why don’t you start with your division of labor. People love the DIY angle to small businesses, in case they fancy a go at one for themselves. Me: Christine Robertson and Summer Jacobs will be in charge of the tearoom, and my daughter, Tallie, and I will be in charge of the book­shop. That’s Tallie Marsh, short for Natalie. To be practical, though, we’re all cross-training. Ug: Right. Nicknames are common enough, but does your daughter dislike her given name? Ug: Are you sure? I only ask because if there’s tension in the news story—between partners, for instance—all the better. Books, tea, cakes, and pillows for strangers’ heads are all well and good, but I’m looking for that jagged shard of tension for an article that really grips our readers’ imaginations. Me (turning to Summer): Do we have tension? Summer: I haven’t noticed any. Ug: A shame. Moving on, you mentioned practicality. Is there any actual, practical bookshop or tearoom experience among you? Summer: Two years in a steamy relationship with a master baker who taught me everything he knew, if you know what I mean, and then one day, between the yeast and the icing, we lost the magic, and I ran away to the Scottish Highlands to lose myself in tea and scones and ultimately find myself. Ug (who’d stopped taking notes at the word “steamy”): Cheeky. I like that. And if your Christine is anything like her mother in a kitchen, between the two of you Cakes and Tales should do very nicely. Now, let’s put the unsavory bits to bed, so to speak, and get back to my original Bogie question— why this bookshop in this town? I feel certain our readers will want to know if this is a trend, alarming or otherwise, toward foreign owner­ship of our homegrown businesses, a snapping up of our heritage, if you will. Although you, Steamy Summer Nights, raised another issue when you mentioned running away. Whether it’s true or not, I’ve read that a great many of the American students who come to study at our universities are either looking for something or running away from something, not necessarily successfully. I wonder which you’re doing— searching? Or running? The interview ended there. Una got a text and left shortly afterward. Her question, of course, lingered. Am I, or are we, searching or running? What do you think— are searching and running the only options? What if we've already found what we're looking for? 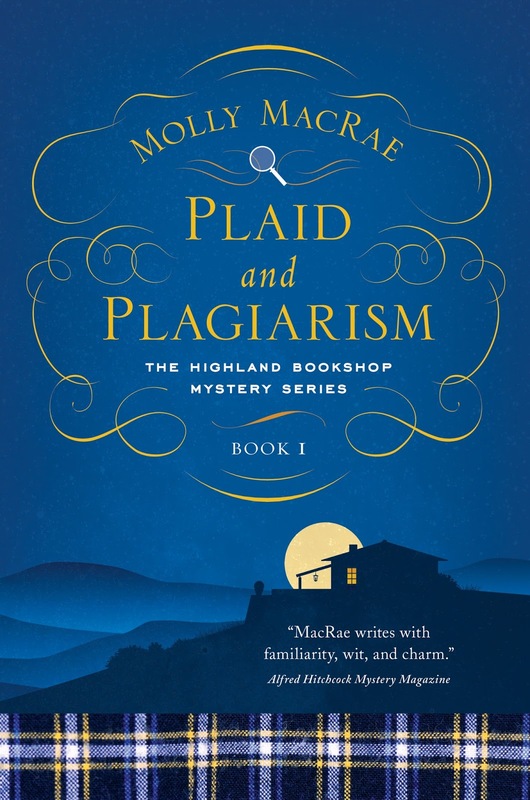 Plaid and Plagiarism, book 1 in the Highland Bookshop Mysteries, comes out December 6, 2016, and is available for pre-order now wherever books are sold. I'm so excited for this to come out! 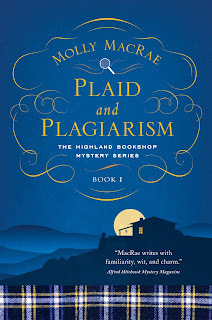 Sounds like an awesome new series by a favorite author. Can't wait.